Senior co-captain Riley Segal advances the ball after shielding out a Cougar defender. 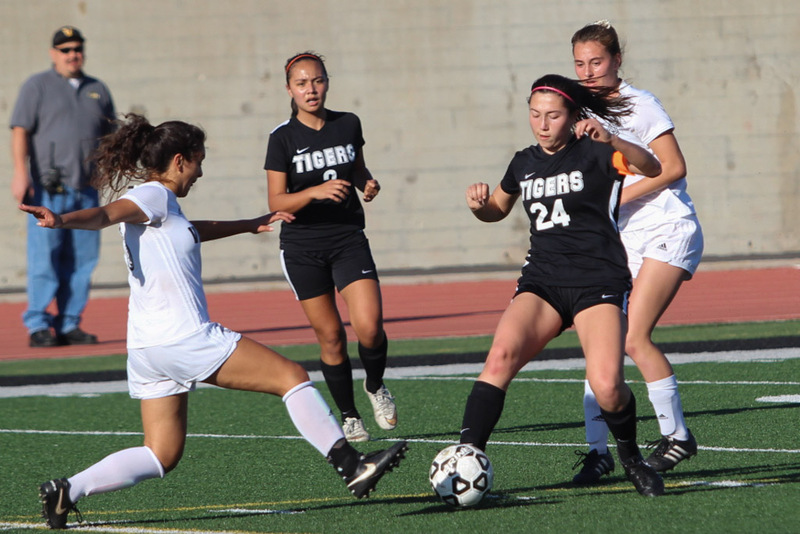 Segal was crucial as South Pasadena attempted to keep its adversary from scoring. 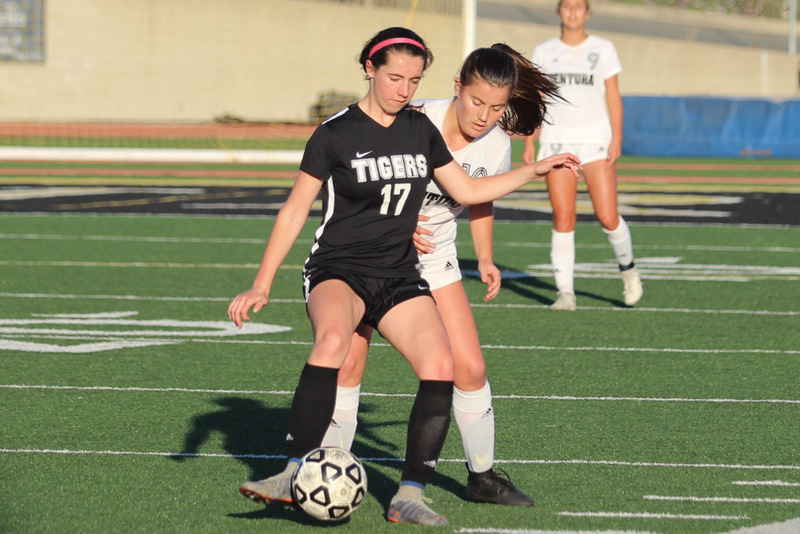 The girls’ varsity soccer team concluded its sensational season with a tough 3-0 loss to the Ventura Cougars at the CIF Southern California Regional Division IV Playoffs semi-finals match away on Thursday, March 8. Though the Tigers let loose their best performance on the field, they ultimately could not contend with the powerful and aggressive Cougars. The 2017-2018 girls’ soccer program leaves behind a 21-4-3 record, with a mere 9 goals conceded and 83 goals scored. Senior co-captain Sophie Reynolds punts the ball deep into Cougar territory to trigger an offensive attack. Ventura was certainly unlike any team South Pas had seen before. Right out of the gate, the Cougars pounced onto possession, undeniably controlling the field. 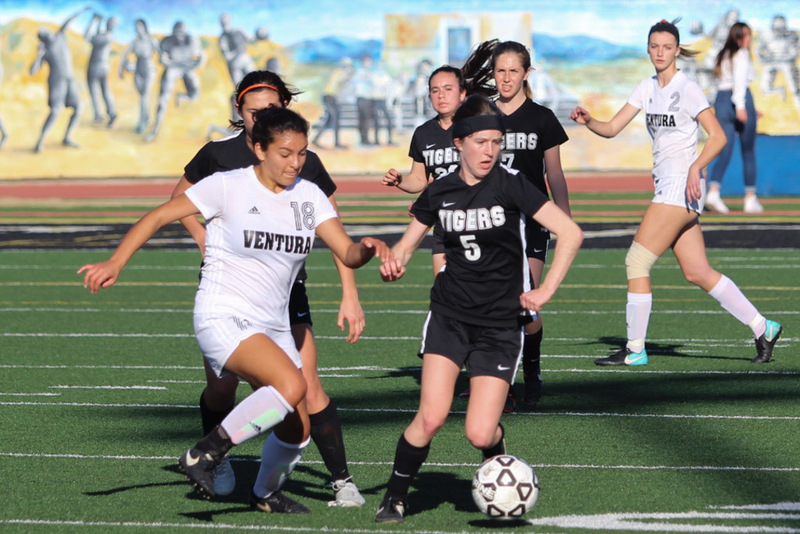 Ventura was quicker than South Pas in every way, winning fifty-fifty balls with ease while bombarding the Tiger defense. Surprisingly, one of the Cougars greatest assets were the mastery of heading balls, shutting down Tiger fly balls with a twist of their heads. 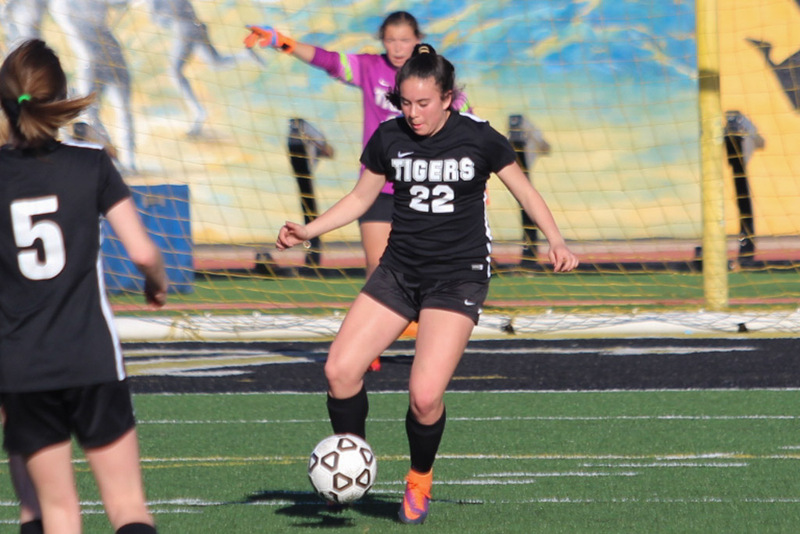 Beyond that, the Cougars pulled together beautiful passing sequences all throughout the match, somehow putting Ventura feet to thwart almost every South Pas opening. 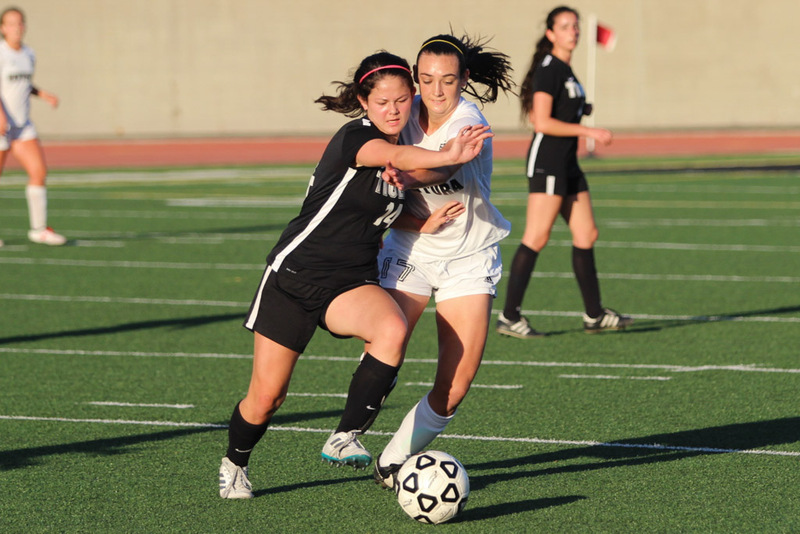 Junior Jade Myers battles for the ball against a Cougar defender in the midfield. Up against such a qualified opponent, the South Pas frontline was not afforded many opportunities on goal. Senior and junior forwards Harper Fox and Uma Hornish put out a few bold bids on goal, but were quickly shut down by Ventura defenders. 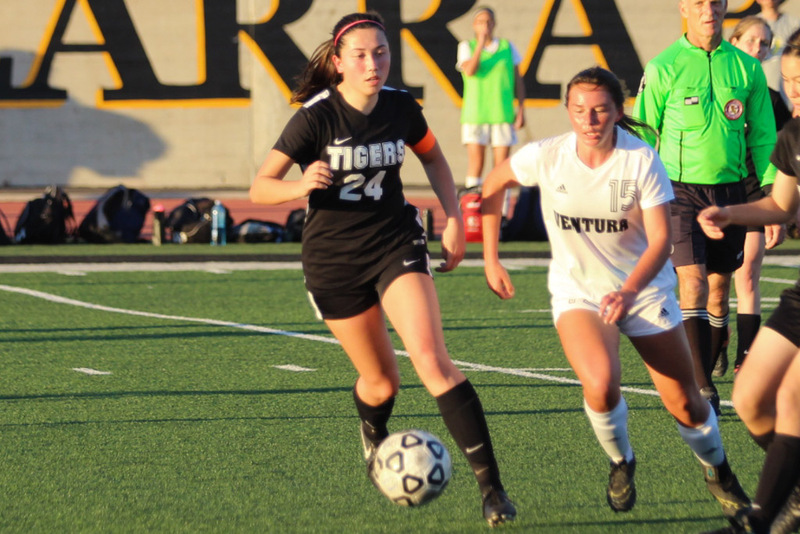 Of course, the Tiger midfield helped from behind, persistently battling out Ventura players all across the field; senior Emily Dunn drove a few particularly strong shots toward the net, unfortunately stopped by the opposing keeper. Junior Uma Hornish protects the ball while slipping a pass to a nearby teammate. 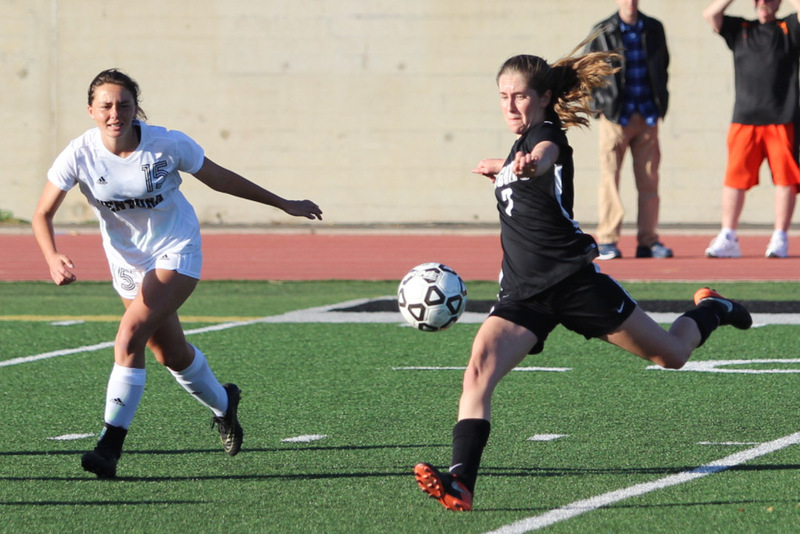 But, by all means, the South Pas defense truly gave it their all against the Ventura attacking line. Again, junior defenders co-captain Alyssa Bonk and Jade Myer pulled their weight guarding the outside shoulders, conducting step after step to counter a relentless Cougar siege. 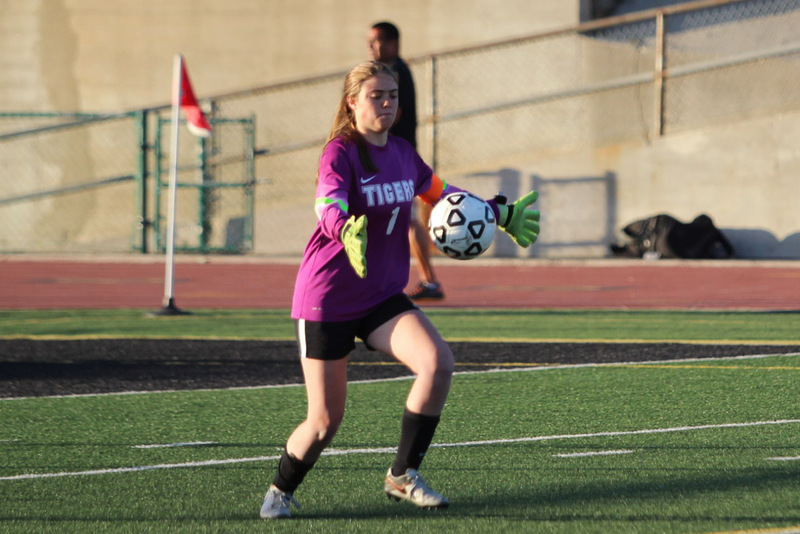 Unlike the Tigers’ last shutout victory, senior and junior defenders co-captain Riley Segal and Booch Barrera were activated onto full throttle, urgently clearing possible goals upwards and outwards. Senior Emily Dunn takes a powerful shot on goal. 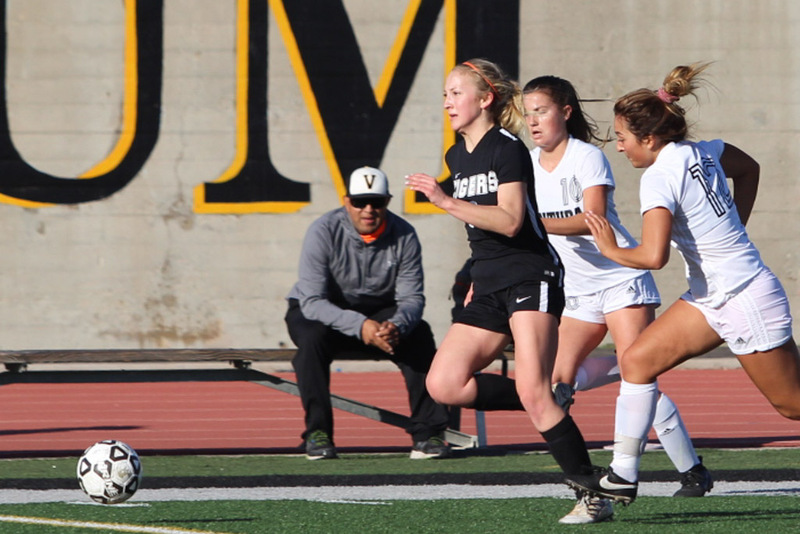 Still, their efforts were not enough to prevent a Cougar goal about fifteen minutes into the half, when Ventura forwards were able to capitalize on miscommunication in the backline, unsettling junior goalkeeper Noemi Howland, and sending a slow ball to the right corner of the net. The second goal was conceded following a mighty Cougar throw in near the box that was again finished by an available forward. Despite the goals given up, Howland executed some spectacular saves throughout the period, including a narrow corner-clearance with only minutes left in the first half. Senior Harper Fox sprints toward the goal after burning out two defenders. The Tigers faced similar woes in the second half, despite bringing a much more composed and focused presentation. Senior defender Celeste Amaya filled in for Bonk, and she proved yet again why she is such a tenacious member of the team. Amaya fought every play until its bitter end, winning balls and knocking down the Cougars’ offensive prowess a notch. Junior Rainey Tilley steals the ball from a Cougar defender. Senior co-captain and goalkeeper Sophie Reynolds also established corresponding strength on the field during this second period. She guided her teammates from her backmost position, roaring commands and warnings when they were needed most. Her keeping, too, was remarkable, as she made upwards of ten different saves. Reynolds’ only goal surrendered arose out of a gorgeous Cougar cross from the 25 yard-line, which was cleanly headed in by another Cougar forward. If there was a goal to be given up, there was no shot as worthy as this one. But, for the remainder of the match, South Pas held their ground and closed their season reminding the audience what a persevering and skilled force they are. Junior Emma (Booch) Barrera gathers the ball back after a dangerous set-piece made by the Cougars. Senior co-captain Riley Segal pokes the ball past a player. The 2017-2018 season for the girls’ varsity soccer team has been nothing short of historic. The team clinched both Rio Hondo league and CIF Southern Section titles– the latter of which not has not been accomplished since 2003. Though the Tigers fell short of a state title, in perspective, they were only one match away from the state championship game. As Coach Lathrop said, the prospects in years to come for the team are certainly promising. Though the program is graduating eight seniors this year, the rising senior class is abundant with talent. Among them are Hornish, this year’s top scorer (13 goals), Tilley, a workhorse in the midfield who has nearly matched Honish’s score sheet (12 goals), Barrera, a season-essential defender in the backline, and Howland, who has paralleled Reynold’s keeping expertise. Until next year’s season in November, the team will part their separate ways, though will always be connected by the legacy of their landmark season. 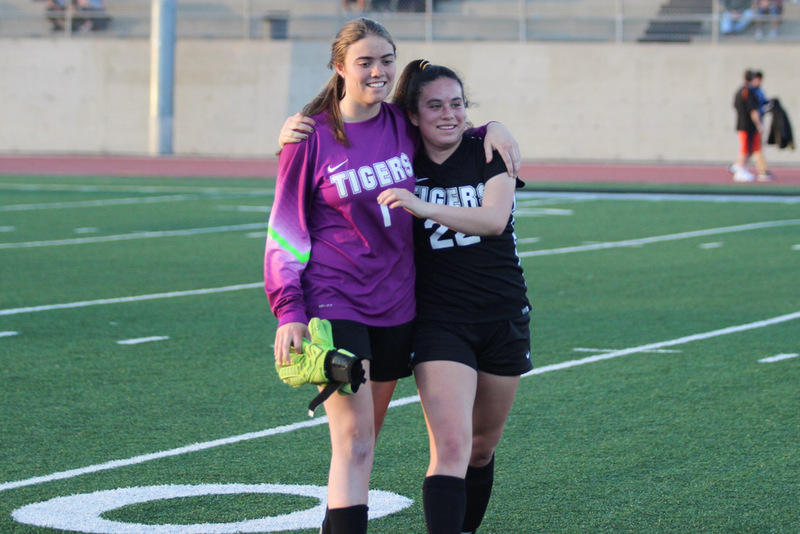 Senior co-captain Sophie Reynolds and Junior Emma (Booch) Barrera embrace each other after concluding a historic season.